I am horrible at keeping quiet when I've got a surprise and/or a present to give, and after my hint (ok so I just flat out told you) in yesterday's post when I gave away my big Knit & Stitch freebie, you are most likely not surprised to see this lovely Knit & Stitch embroidery alpha today that coordinates with the kit. And if you are surprised, well yay because that was the original intention:) The coordinating alpha comes with both upper and lowercase and a few punctuation marks. Hopefully it will add that finishing touch to your titles or other text by giving them a fantastic stitched look. 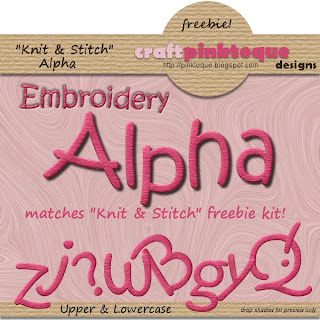 For now, download the Knit & Stitch Embroidery Alpha HERE! I hope you enjoy the alpha and stay tuned for a new freebie tomorrow! Be sure to check back, crocheters, I'll be sending you some freebie love in an addon pack for the Knit & Stitch kit later in the week :) Thanks for the suggestion, jetfuelonly! Thank you! Your blog post will be advertised on the DigiFree Digital Scrapbooking Freebie search engine today (look for timestamp: 07 Aug [LA 12:00am, NY 02:00am, UK 07:00am, OZ 05:00pm] ). Thanks a lot for this lovely alpha. TY for the alpha! Sure glad I found your site!